Updated diameter values for conductors. 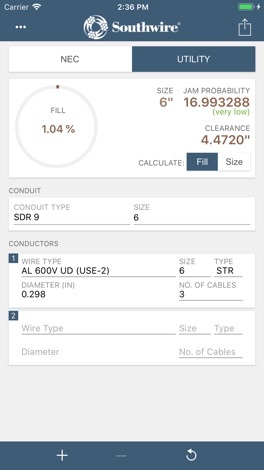 Southwire has created this great tool to help electricians, engineers and contractors answer the question, “What size conduit do I use” per the NEC®, includes fill percentages and jam probability. If you do not have the NEC book handy or do not want to spend time manually calculating the Conduit Fill %, this is the right app for you. The app provides quick and easy navigation. Enter the Conduit Type and Size and specify your conductors. 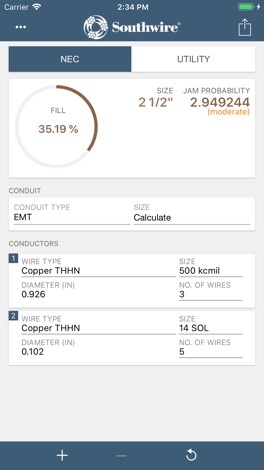 The App will calculate the Conduit Fill % as per NEC Guidelines. 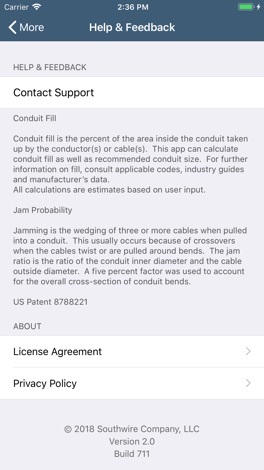 The App Answers the question, “What size conduit do I use” includes fill percentages and jam probability per the NEC®. With one click, you can email your results.